Ipswich’s architecture is a mish-mash of timber framed houses, Victorian terraces,1960s tower blocks and new modern developments - which have sprung up near the harbour and the new university campus. Some of the best places to stay in Ipswich are architectural delights, as well as comfortable and welcoming. Ipswich has lost its position as one of the UK’s major ports, but it has managed to comfortably switch industries, and is now is host to several large financial secondary offices, so there’s plenty of life to this city. And the new University of Suffolk campus certainly helps too. The architecture, which includes some ancient highlights as well as one of the UK’s youngest Grade I listed buildings (the Willis Building which was Norman Foster’s first major project) is also a draw, plus Ipswich has several museums and art galleries and is known for its dance spaces, parks and market. Stroll around the Christchurch Park with it's lovely wooded and open areas making it a great place for a walk. There's also a playpark and tennis courts for those looking for a more active experience. Ipswich waterfront is a charming place to watch the world go by with yachts coming in and out of the marina. There's also an ample number of restaurants and cafes for a meal with a view. Christchurch Mansion is worth a visit to learn about the area's history and enjoy various beautiful art pieces. Or enjoy a great day out with the family at Jimmy's Farm. It features various species from goats to a tapir. There's also a butterfly house and restaurant ensuring plenty for all the family to see and do. Our pick of the best places to stay in Ipswich is in prime position for enjoying all the nautical charms of the town's waterfront. A fun conversion from an old salt warehouse, the Salthouse Harbour Hotel is right on the waterfront, by the harbour. There’s a good restaurant, funky decor and eye-catching modern art. If you'd prefer a self-catering option this holiday, don't hesitate to visit our online partner or cottage Booking.com for a great selection of centrally located properties - perfect for exploring the town. Fly to London Stansted Airport located 75km (47 miles) from Ipswich with connections to Europe and Africa. The airport has a regular bus service which runs between Stansted and Ipswich. Alternatively, catch the train to Ipswich with rail links to major destinations including London and Norwich. Best time to visit - although the town is something of a year-round destination, the summer months from June to early September provide the warmest weather for enjoying the parks and outdoor spaces. Alternatively, widen the net and look at all our Suffolk recommendations. 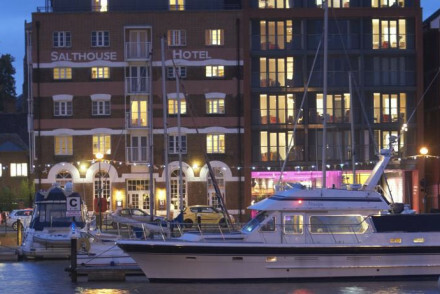 Contemporary funky hotel in a converted salt warehouse on the waterfront of Ipswich Harbour. Trendy rooms are comfy, individual and filled with modern art. The waterfront restaurant serves up local sustainable produce. Ideal for stealing away. Local exploring - Right on the waterfront this is the ideal location for exploring all Ipswich has to offer. Sights nearby - Christchurch Mansion and Park are only one mile away.